U.S. President Donald Trump listens during his meeting with Japanese Prime Minister Shinzo Abe at the White House in Washington, June 7, 2018. U.S. President Donald Trump said Thursday that he would invite North Korean leader Kim Jong Un to the United States if the upcoming summit with Kim went well. On the other hand, he said he was also prepared to walk away from the summit. 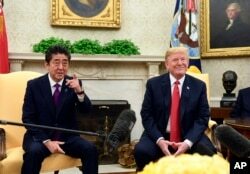 Trump held a two-hour meeting with Japanese Prime Minister Shinzo Abe at the White House on Thursday, less than a week before his summit with Kim in Singapore. The summit with North Korea and trade were the focal points of the discussions. Abe sought reassurance from the United States that progress would be made on limiting North Korea's nuclear and ballistic missile programs. He also wanted Trump to discuss with Kim the issue of Japanese nationals kidnapped by North Korea during the 1970s and 1980s. At a post-meeting joint press conference, Trump promised Abe he would raise the abduction issue during his meeting with Kim. "He [Abe] very much talked about abduction. It was preeminent in our conversations. He talked about it long and hard and passionately, and I will follow his wishes, and we will be discussing that with North Korea, absolutely," Trump affirmed. Trump said he was open to signing an agreement on June 12 with North Korea to end the Korean War, but cautioned that it was just the first step. "Sounds a little strange, but that's probably the easy part. The hard part remains after that," Trump warned. President Donald Trump meets with Japanese Prime Minister Shinzo Abe in the Oval Office of the White House in Washington, June 7, 2018. Trump also told reporters he would like to see the eventual normalization of relations between the United States and North Korea. "Normalizing relations [with North Korea] is something I would expect to do, I would hope to do, when everything is complete. We would certainly hope to do that," Trump declared. Trump said that the "maximum pressure" strategy on North Korea was still in effect and that the U.S. had not removed any sanctions imposed on North Korea. However, he said, the administration decided not to use the term before going into a "friendly" negotiation. "Perhaps after the negotiation, we'll use it again. You'll know how well we do with the negotiation. If you hear me saying, 'We're going to use maximum pressure,' you'll know the negotiation didn't do well," Trump told reporters. Trump added that the United States has a list of over 300 sanctions to put on North Korea, but he said he didn't want to use them unless it was necessary. Trump said if the summit went well, he would invite Kim to the United States. "I think it will be well-received, and I think he will look at it very favorably," the president said. "So, I think that could happen." Asked whether he would invite Kim to the White House or Mar-a-Lago, Trump's Florida estate, Trump answered, "Maybe we'll start with the White House. What do you think?" On the other hand, Trump said he was also totally prepared to walk away from the summit, as he did it once before. Japan's Prime Minister Shinzo Abe and U.S. President Donald Trump arrive for a joint news conference in the Rose Garden of the White House in Washington, June 7, 2018. "It could happen. Maybe it won't be necessary. I hope it won't be necessary to walk, because I really believe Kim Jong Un wants to do something that is going to be great for his people, and also his family, and great for himself," Trump contended. Trump praised Japan's and South Korea's cooperation during the past months, and he gave credit to Abe and South Korean President Moon Jae-in. Trump also thanked Chinese President Xi Jinping for his help in the process. "President Xi of China has been terrific. The border has been more closed than ever before. I'd like them to close a little bit more. China has never worked with us this way," Trump said. At the press conference, Trump also revealed the contents of the letter Kim wrote him last week. Trump said the letter said nothing other than "we look forward to seeing you," and "we look forward to the summit." He described the letter as very "warm" and "nice." Before his meeting with Abe, Trump told reporters the summit was "much more than a photo-op, " and that the outcome of the summit would depend more on "attitude" and "willingness" than preparedness.